The Boston Flute Academy is honored to have had BSO flutist Fenwick Smith on our flute faculty for six years, beginning in Fall 2010. Our students of all ages have enjoyed many Master Classes and private lessons with Mr Smith, along with semester long courses for advanced players on how to take successful orchestral auditions. His insight, intelligence, thoughtful interpretations, and amazing demonstrations made a lasting impact on all our BFA teachers and students. Mr. Smith joined the Boston Symphony Orchestra as second flutist in 1978, and played his final concert as a member of the Orchestra on August 27, 2006. During that time he spent five years as acting assistant principal flute of the BSO, and first flute of the Boston Pops Orchestra. Before joining the BSO, Mr. Smith was a member of the New England Woodwind Quintet, performed on Baroque flute with Boston’s leading early-music ensembles, and for thirteen years was a member of the contemporary music ensemble Boston Musica Viva. Mr. Smith has also been a member of the Boston Chamber Music Society since 1984. After thirty seasons, his annual recitals (in Jordan Hall since 1983) have become a prominent feature of Boston’s concert calendar. In recent years Mr. Smith introduced to Boston audiences Lukas Foss’ Renaissance Concerto, and the flute concertos of John Harbison and Christopher Rouse. His interest in bringing unusual and little-known flute music to a broader public has resulted in premiere recordings of works by Copland, Foote, Gaubert, Ginastera, Koechlin, Dahl, Harbison, Cage, Pinkham, Schulhoff, Schuller, Schoenberg, Rorem, and Reinecke. As a former faculty member of the New England Conservatory, where he was a studio teacher and chamber music coach, Mr. Smith was the recipient of NEC’s Laurence Lesser Award for Excellence in Teaching. 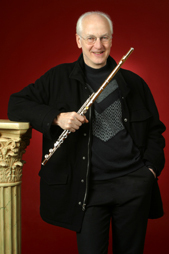 Fenwick Smith was Visiting Professor of Flute at the University of Michigan School of Music for the academic year 1997-98, and has presented masterclasses in China, Japan, Europe, and across the United States. For more details on his distinguished career, you may visit his website, www.fenwicksmith.com.